PM Modi met with Shinzo Abe and Malcolm Turnbull, with talks focusing on crafting a new strategy for the Indo-Pacific region. Manila: In the backdrop of an emerging configuration of a key quadrilateral alliance, Prime Minister Narendra Modi today held separate talks with his counterparts from Japan and Australia. PM Modi met with Shinzo Abe and Malcolm Turnbull, with talks focusing on crafting a new strategy for the Indo-Pacific region. On the sidelines of the ASEAN summit, PM Modi also held bilateral meetings with Vietnamese premier Nguyen Xuan Phuc, Sultan of Brunei Hassanal Bolkiah and New Zealand Prime Minister Jacinda Ardern, and discussed ways to further ramp up cooperation various key areas like trade and investment and maritime security. On Sunday, India, Australia, Japan and the US held their first meeting to give shape to the much talked about quadrilateral alliance to keep the Indo-Pacific region "free and open". 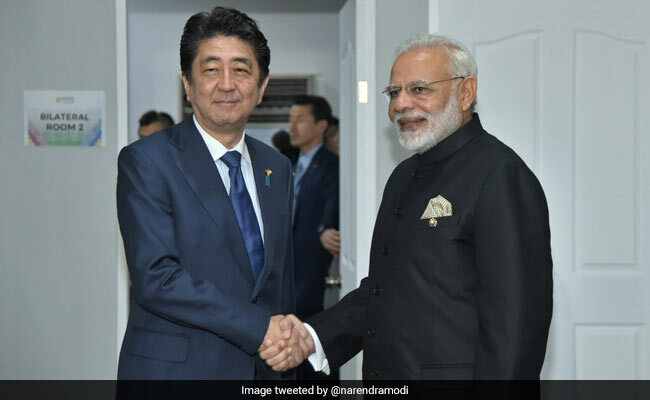 The issue was discussed during the Modi-Trump meeting on Monday and is understood to have figured in the Prime Minister's talks today with both prime ministers Abe and Turnbull. "My friend @AbeShinzo and I had an excellent meeting in Manila. We reviewed the ground covered on various aspects of India-Japan ties and discussed ways to deepen cooperation between our economies and people," PM Modi tweeted. Preeti Saran, Secretary (East) in the ministry of external affairs told a media briefing that political and security cooperation, regional developments and cooperation in connectivity projects including the Asia-Africa growth corridor were discussed. She said the two leaders also deliberated on bilateral economic cooperation including implementation of the dedicated freight corridor and the bullet train project. Earlier, foreign ministry spokesperson Raveesh Kumar said the two leaders held a "wide ranging and engaging" discussion on "intensifying" the Special Strategic and Global Partnership. A number of issues including bilateral cooperation in defence and security sphere were discussed in PM Modi's meeting with his Vietnamese counterpart. "Vietnam's PM, Mr Nguyen Xuan Phuc and I held wide ranging deliberations on enhancing India-Vietnam friendship, which can greatly benefit our citizens and region," PM Modi tweeted. Ms Saran said issues relating to defence cooperation and India's oil exploration in the waters of Vietnam were high points of the talks. She said both leaders expressed satisfaction over defence cooperation. China and Vietnam have an acrimonious relationship due to their standoff over the South China Sea, a huge source of hydrocarbons. China has been objecting to India's oil exploration projects in the disputed waters. The Modi-Phuc meeting came days after Donald Trump's visit to Vietnam where he offered to mediate in the South China Sea dispute between several ASEAN member countries, including Vietnam and China. On his talks with Malcolm Turnbull, PM Modi said he was delighted to meet the Australian Prime Minister and that their discussions today added new vigour to the friendship between the two countries. In a tweet, Turnbull described the meeting as "productive" and said the discussions focused on increased economic cooperation, security and counter-terrorism. Ms Saran said PM Modi and Turnbull discussed the regional situation, ways to deal with terrorism and terror financing and issues relating to comprehensive economic cooperation agreement which will include goods as well as services. PM Modi also thanked his Australian counterpart for extending his courtesy to an all-women Indian Navy team, which is on a global circumnavigation trip, when they arrived in Australia last month. The Prime Minister described his meeting with the New Zealand Prime Minister as "wonderful", adding that they discussed deepening economic and cultural cooperation between the two countries. On his meeting with the Sultan of Brunei, PM Modi said the "extensive talks" will broaden bilateral ties between the two countries. "Glad to have met Sultan Hassanal Bolkiah of Brunei. Our extensive talks will broaden bilateral ties between our nations," he said in another tweet. Mr Kumar said both leaders had fruitful discussions on expanding bilateral partnership, specially in trade and investment, renewable energy, culture and people to people contacts.